If you are new to Ruby I suggest you first read my previous post which in short explains why you should not give up on learning Ruby. Starting with this post, I’ll be writing some tutorials covering the first steps you could follow in order to get familiar with both the language (Ruby) and the framework (Ruby on Rails). My posts will be based on my own experience so I hope that anyone new here can understand them easily. 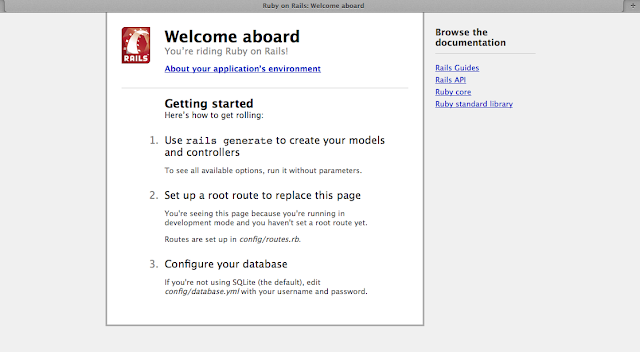 First things first, install ruby and rails on your machine. There are plenty of installation tutorials out there from which you can pick the one matching your machine’s operating system. I followed this one in order to install Ruby 2.0 & Rails 4 on OS X Mavericks. Text editor: I prefer using Sublime Text which is an excellent text editor with many plugins. There are a lot of other options but this is something you don’t have to decide now. Give them a try and you’ll find the one you like the most. Update 2016: I now prefer using GitHub’s Atom editor. Console: I use iTerm2 which is a powerful replacement for OS X’s Terminal application. The command above will create a folder with the name hello_world. Inside this folder you will find various files and subfolders which actually constitute a Rails application. In this post I will only explain the files/folders to which we are going to make changes on (a thorough explanation will be provided in an upcoming one). You already have a web server installed in your system that comes bundled with Ruby and its name is WEBRick. Let’s start it to see what we have created by the last command. Before we continue, I will try to explain in a simple way how a rails application works. Every request to the application is served by methods (called actions) which are defined in special files called controllers. These actions execute what has to be executed and define what the response will be (for example an html page, a JSON object etc). The responses (e.x. a page) are defined in special files called views but there are cases (such as when responding with a JSON object) that an action’s view is not required to be defined. Yes, pages_controller.rb is our controller. In this file we are going to create our action that will serve the “root” (home) request to our application. The erb extension implies that this file will be processed by Rails in order to embed any dynamic content. What’s left? Yes, we must route the root requests to our controller’s action. You will find a bunch of help comments (text starting with #) there which you can delete. We could stop here but it would be nice if we had the Hello world! text being passed to the view from the controller’s action, yes? Yes. @greeting = "Home action says: Hello world!" Here, we declared an instance variable to our controller with name greeting and value Home action says: Hello world!. 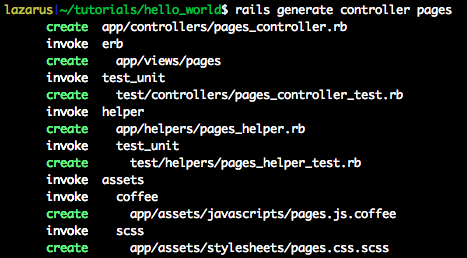 There, you just created your first Ruby on Rails application! What’s next? How about creating a simple ToDo application?